Gird yourself with armour fashioned from the Essence of Black Ice. Become an efficient, unyielding soldier of the Rakh from the ConQuest universe. 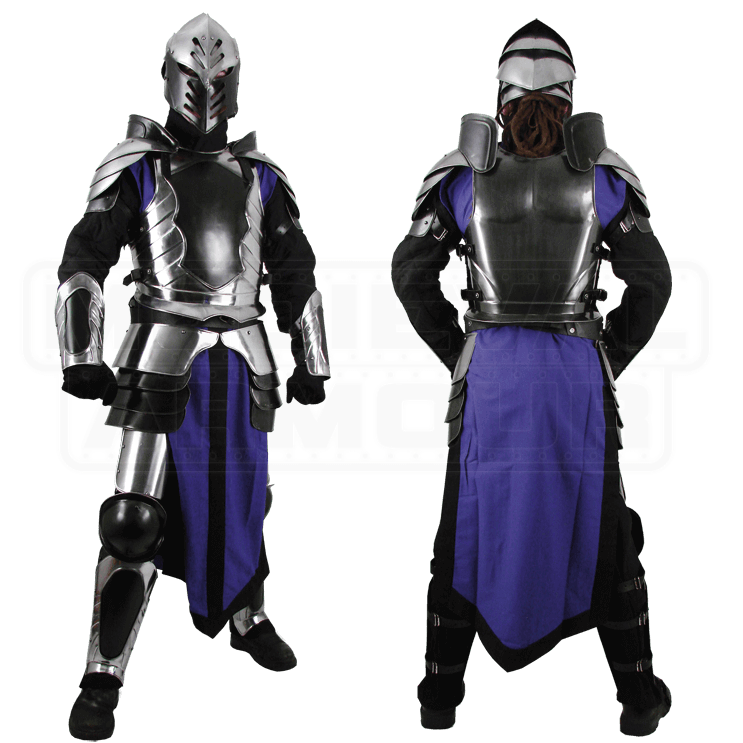 Enter your next LARP battle fully suited with the Black Ice Complete Armour Set. 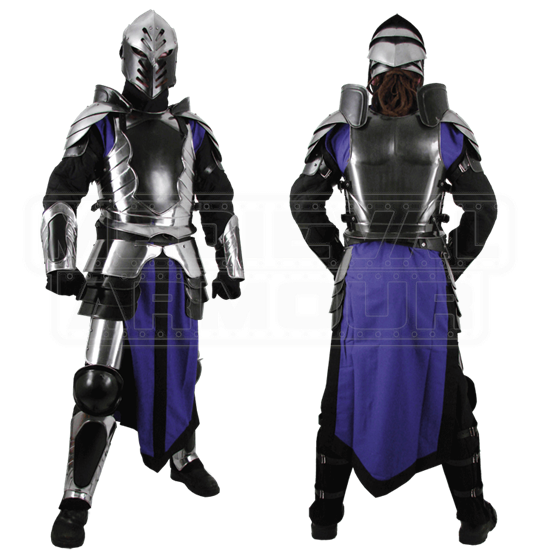 This stylized armour package includes the cuirass, tabard, pauldrons, tasset belt, full leg armour, and bracers. Black trim accents the violet-blue tabard. The arm bracers and full leg armour provide durable protection to your limbs during a LARP event. The cuirass and pauldrons safeguard your torso and shoulders. A polished steel and black paint finish covers each armour piece. Rolled edges and rivets aid in deflection. Adjustable buckle straps provide a more customized, comfortable fit. The Black Ice Complete Armour Set matches perfectly with our Black Ice Helmet and Black Ice Gauntlets. Armour Weight is about 34.7 lbs. These are measurements of the armour only. These measurements do not include the straps or buckles. This will show you how much of your forearm the bracer will cover and how much of your shin the greave will cover. The tabbard is open on the sides. Very nice and comfortable. I added a gorget to the armour which made the pauldrons fit more comfortably. This armor has really nice range of motion. There was a little over-spray on the black areas. Easily fixed with a light scratch of a hobby knife.